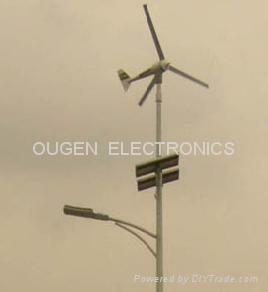 60W Wind & Solar Led light system. The solar panel(s) are poly technology,with a full solar panel replacement warranty of 10years against the power output of the solar panel degrading by over 10% plus a 25 year warranty against the solar panel degrading by over 20%. The panel(s) are UL listed and get IEC61215,TUV CE, IEC61730 certification. Our capacity is 50MW per year. 1.Material wind turbine blades by injection molding from the high intensity of ultra-high-precision engineering plastic,quiet and smooth running. Generator—adopted from high-quality rate earth permanent magnets,with small size,light weight and high-efficiency power generation. Model—applicable to a wide range -30 to 60 degree ambient temperature and high humidity, wind and salt spray sand and other environment,high reliability. The batteries are fully warranted for a minimum of 3 years. 1. The illuminating source shall be a LED light or CFL light.The lamp shall use rare earth phosphor coatings to obtain a color rendition index of at least 87 and a color temperature of 4,100k or 6,000k. 2. Using Cree and SSC top quality of LED, reach 110lm/w. which can be used more than 7years,which have awarded "Certificate of utility model patent" and "Invention patent".